Which gig is the most significant gig? A successful one-man show on Broadway? A movie first stunt roll with residuals? An ongoing stage performer with a long-term theater run like The Flying Karamazov Brothers? Or a premier player in a significant Metropolitan Opera production in New York? Andy Sapora has done them all except for the first two. The IJA 2004 Lifetime Achievement Award winner (in Buffalo, NY, for his work with The Flying Karamazov Brothers), Andy Sapora, is currently performing as a principal actor in the Metropolitan Opera’s production of Pagliacci, one of the Met’s most popular repertoire productions. Pagliacci by Ruggero Leoncavallo has been performed by the Metropolitan Opera Company in New York 735 times since 1893. Arguably, one of the three most recognizable opera characters (together with Carmen and Figaro), Pagliacci is the seminal tragic clown. The joker who makes everyone laugh, but who, himself is weeping beneath his painted smile. And, of course, Pagliacci has his comedic troop of three stumbling bumbling knuckleheads. And the leader of the force is the International Juggler’s Association award winner Andy Sapora! Andy was a natural for the part which called for energetic physical comedy, circus skills, clowning experience, and musical timing. 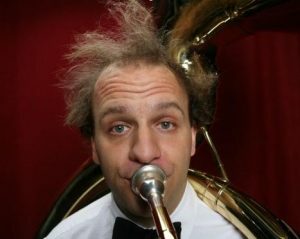 Though not a singer, Andy is an accomplished musician on tuba and other instruments. So while Pagliacci (played by Roberto Alagna from France) sings and his naughty wife Columbine (Aleksandra Kurzak of Poland) flirts and provokes, Andy’s group keeps the audience amused with clowning, buffoonery, and juggling. 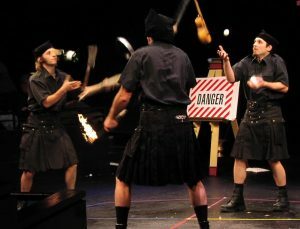 In fact, Andy executes three separate juggling skill stunts which were approved by the director, Sir David McVicar and his special comedic vaudeville consultant, Emil Wolk. Wolk won the Laurence Olivier Award in 1988 as Best Actor in a Musical for Kiss Me, Kate. He also appeared as Puck in Midsummer’s Night Dream and was director of Circus Oz in 2008. While setting up the stage for Pagliacci’s show, Andy takes a sofa-sized canvas board and casually balances is on his chin. Later, while helping Columbine in the kitchen, Andy juggles three plates. Finally, while baking a cake, (and just before the pie fight), he juggles five real eggs for twenty-six throws. Pagliacci is the story of Canio, the Italian travelling performer, and his group of actors. They arrive in a small village in their clunky old truck which converts to a make-shift stage. They attract as much attention as possible to spark interest in the sceptical villagers, announcing tonight’s performance and winning them over. 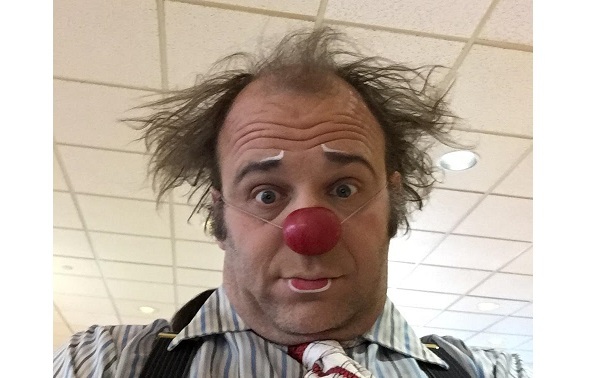 The name of the show is ‘Pagliacci, the Clown.’ Canio plays the lead part in the show which tells the story of Pagliacci who wants nothing more than to make people laugh, while all is not right at home. Pagliacci’s wife, Columbine, played by Nedda, Canio’s actual wife, is a flirt. Pagliacci is jealous, suspicious, and always just missing catching her in the act. The only problem is that Canio’s wife Nedda is herself a restless housewife (without a house) and is having an affair with Silvio. Canio suspects Nedda but has no proof. His suspicions are driving him to madness. So while he and his troop are making the audience guffaw with laughter, he is seething with anger and frustration just below the surface, and about to pop. The audience is impressed with his hilarious antics and his realistic flashes of jealousy. Columbine gleefully enjoys insulting and provoking him. She has him wrapped around her finger and wants nothing more than to see him humiliated further and further. It all makes for excellent drama, and the villagers cheer enthusiastically until Columbine goes too far and Canio’s mind snaps. He produces a dagger and plunges it into her heart to the shock of the villagers and the other actors. But Silvio runs to her rescue too late and reveals himself, justifying Canio’s rash action. Canio stabs Silvio to death. When this production put out a casting call in 2015, Andy’s friend and clown colleague Anna Zastrow, told Andy about it. Many people from all walks of life and levels of experience showed up. Andy had the combination of knowledge, skill level, comedic timing and sensibility, and musical acumen to land the job. The production was a hit and will be ongoing. The Met produces about 20 operas per season (Sept-May). Each opera is performed about six times over the course of a month. The performers are paid during those weeks and for two weeks rehearsal before the season premiere. Most of the operas performed are ‘repertoire,’ meaning established and played again and again, such as The Magic Flute, or Rigoletto. 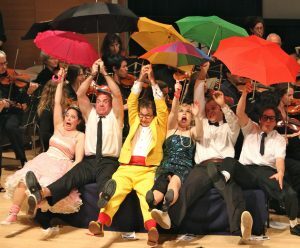 Each year they premiere about six new productions, either a new working of a classic opera with new sets and costumes and directors or an entirely new opera by a contemporary composer. The administrators must strike a balance between showing the old tried and true productions and keeping it up-to-date to attract a new generation of opera-goers and to keep the regular clientele interested by re-working the standards. This Pagliacci is a re-working of one of the all-time classics, and fortunately, it was well received and will be performed again and again every couple of years. A steady gig by any standard. Andy has had a long and colourful career up until now. “To get this gig, I had to have exactly the combination of skills and experiences that one would have grown up and been always told to stop doing. ‘Put that down.’ ‘Don’t touch that.’ ‘Will you act your age.’ etc. Andy grew up near Baltimore. His parents were college professors. He saw the Flying Karamazov Brothers at age 11, and he taught himself to juggle and started working gigs at the local mall. He learned to pass up to 9 clubs with partner Brian Ferraro. They began street performing and teaching juggling at the Maryland Renaissance festivals and shared the stages with The Raspini Brothers, Scott Meltzer, The Passing Zone, Airjazz, Waldo, Butterfly Man, and Tony Duncan. In 1995, he spent a year at the Jacques Lecoq theater school in Paris. In 1996 he spent one year at the Belgium National Circus Academy in Brussels. He learned under Albanian circus teacher Ariane Milouka, and Arcadie Pupoune of Kiev. In 1998 he auditioned for the Flying Karamazovs. In 2002 he started in their 2nd company, but also filled in for the primary company in 2003 and subbed from 2004 to 2008, learning all the parts so that he could sub for any member. In 2009 and ongoing, he toured and understudied including longer sit-down runs both off-Broadway and on London’s West End. A highlight was in 2003 when Robert Woodruff of the American Respiratory Theater (ART) in Cambridge, Massachusetts put a benefit performance together bringing all original, past, and current members of The Flying Karamazovs together for a one-time event. 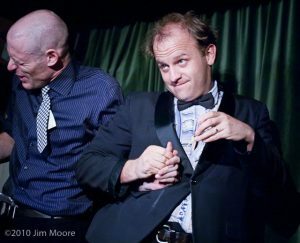 This event allowed Andy to share the stage with Sam Williams, the Karamazov founding member who initially inspired him to begin a career in comedy and show-business. Since then and concurrently, Andy led two other significant projects, The Maestrosities from 2005 to 2012, and tiny DANGEROUSfun! from 2009 to 2013. The Maestrosities was a four-man, two-woman clown band that Andy started together with Jenny Lee Mitchell. Glen Heroy, David Gochfeld, Gina Samardge, and Rod Kimball. All the members were talented and experienced clowns and musicians. Andy played the tuba. There was also trumpet, clarinet, accordion, spoons, and ukulele. The comedic possibilities were endless including having the band leader explain to the audience how valuable and delicate the ukuleles were while the other members juggled and passed them behind his back. Maestrosities performed all over New York and were guests at the National Comedy Festival in China. tinyDANGEROUSfun! was a monthly variety night in Brooklyn, which became a venue for local artists. Together with John LeoNimm, they would host a bunch of odd and uneven characters to the delight of the beatnik audience. Some of the more memorable performers were Slash, the lively and vivid story-teller, and Vladimir, who could tell you what day of the week any random date fell on, past or future, including birthdays. Since 2008 Andy has been clowning hard with Healthy Humor Red Nose Docs. 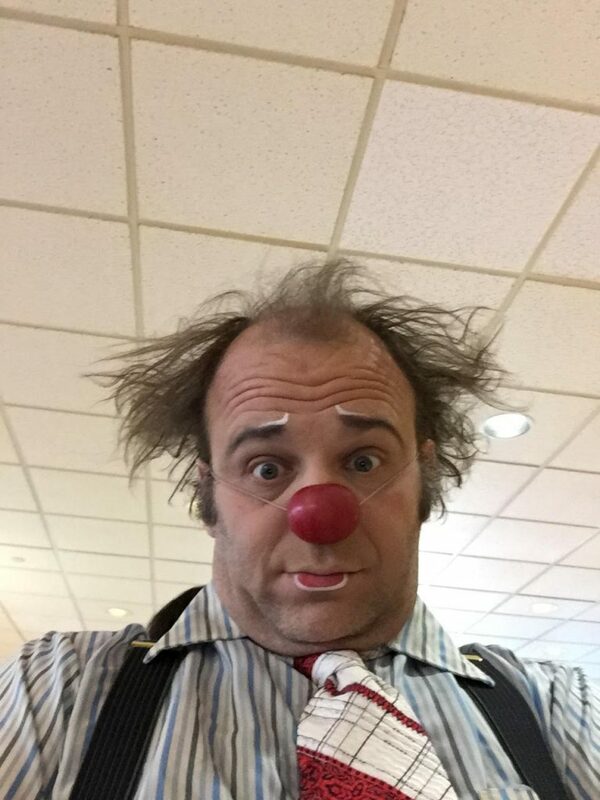 Maestrosities member Glen Heroy suggested Andy join the Big Apple Circus Clown Care team. This team morphed into the current company which goes to hospitals all over the city and across the US. What does the word opera mean? Opus means work (as in magnum opus – a great work) and opera is the plural of opus, so opera means works. Opera is a combination of the seven arts. There is architecture, sculpture, and painting in the set design; there is poetry in the libretto; there is performing and acting in the drama; there is obviously music in the orchestration and singing, and there is frequently dance as part of the theatrics. But there is also costume design, sometimes puppetry, and other disciplines. 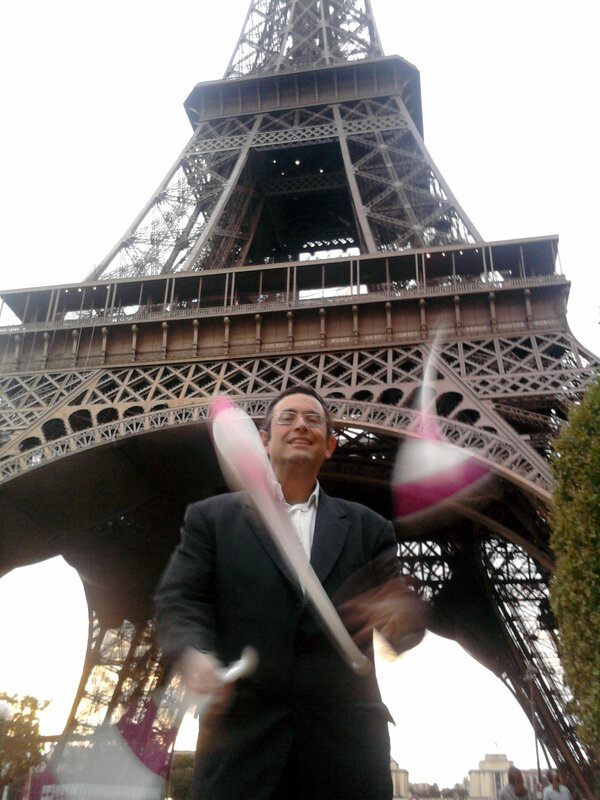 And now there’s juggling too.